Vampire’s Fall: Origins is a new open world game for mobile devices in which the player plays as a vampire and power-up himself to strike down the enemies. In the first phase of the game, you complete some quests such as interacting, beating the beast, and more. After it, the villagers will appoint you as the defender and send you to battle against the Witchmaster. You will lose that battle as Witchmaster is very powerful and you don’t even own good quality gears. Vampire’s Fall: Origins features turn-based combat system. If you are having trouble understanding the game’s mechanics, then this beginner’s guide will help you. In today’s post, we have shared an early walkthrough along with the Vampire’s Fall: Origins guide and Vampire’s Fall: Origins tips, cheats & strategies. Before heading to the tips, cheats & strategy guide part, let’s learn the basics first. In Vampire’s Fall: Origins game, your main objective is to increase the power of your character. And you can do it by obtaining high-quality gears; weapon, armor, accessories. We will go deep into the gears detail in the weapon guide part below. Another way to increase the power of the character is by spending skill points, ability points. Skill points are used to unlock the skills of the character(Skill == Blood Lines). And the ability points are used to unlock/upgrade abilities of the character. You earn these points by increasing the level of the character. To increase the level, battle against the enemies, win the battles and obtain EXP(experience points, required to level up). You also earn EXP by completing the quests. When you start the game, you find yourself in the village; there are some people, house, and objects. The two main persons on that screen are; Captain Angmar, Emeline. Interact with the Captain Angmar and buy a weapon or gear. Emeline – Restores Health. Once done, head outside the village(you will randomly interact with the rats, beast, enemies on the field). On the main screen of the game, at the top, tap the map option(In the latest update, mini-map is at the top-right corner, tap it. After it, tap anywhere to mark the location). The skull pointer shows your current location. (i) symbol shows the location of objects or people(you can interact with the objects and people). The battle symbol shows the location of the main enemies. In Vampire’s Fall: Origins game, the player’s main job is completing the quests. On the main screen of the game, at the top, tap the recruit/vampire button -> at the bottom menu, head to the quests tab(In the latest Vampire’s Fall: Origins update – Quests tab is at the top center of the screen). There you can see the available quests. As you interact with people, you will get more quests. Tap the quest to check details. In the first event of the game, you first give the package to the guard(the first guard, meet him at the Green-Wood Route). After it, beat the beast near the campfire(around trees, swarm). Once done, follow the on-screen instructions and defend the village from Witchmaster. After it, the Witchmaster will destroy everything. You will drink the blood, bite the fellow person on your way and enter the real game. So that’s the early game walkthrough. All you need to do is complete the quests. Since quests are a little bit complicated and for a beginner, it would not be easy to complete them. All you can do is move around the map, understand the quest. Some quests also don’t provide too many details. That thing may stuck you. Hope you will do it. First, learn the map and then move. That’s it. In this part, we will learn about the weapons, battle, skills/bloodlines, abilities, and much more. You can equip two weapons to the character; main, secondary. Tap the vampire button at the top of the screen -> inventory -> hold down the item and drag to the left side to one of the empty slots. If you want to get the information of an item, tap it. Tapping the item will give you the details; armor power, damage power, buffs(bonus), and weight. Or head to the character tab -> there you can see the stats of the character; dodge chances, armor power, critical hit chances, focus, and more. Depending on the weapon, armor, accessory items, your character performs in the battle. So your another objective is obtaining the best gears. How To Get Weapons or Gears In Vampire’s Fall: Origins Game? How To Sell? By default, you get loot(weapons, gear items) by winning the battles. But usually, you get low-quality weapons. You can purchase these gears or weapons using the gold. How to purchase? There is no store type feature in the game. All you can do is find the merchant(interact with every person to find). For example; In the Westwood farm location, you will meet a blacksmith. From him, you can buy gears; armor, weapons, accessory items for gold. How to obtain gold? Complete the quests, defeat the enemies in the battle, open the chests to get gold. When you interact with these merchants, a new screen will appear; listing the gears or items. Tap the item to view details; bonus effect, damage power, dodge chances, block chances, and more(rarity; rare)If you have enough gold, then buy the gear. Don’t waste gold by buying low-quality gears. And on the same screen, at the bottom, there would be a sell tab. Head to the sell tab -> tap on the item to sell to the merchant for coins. As you progress in the game, PvP feature will get unlocked. To play it, you can either visit the location named Marid’s Lair Of Duels or on the main screen, at the top-right corner, tap the stone button. In this mode, you battle against other vampires for the rank. In the battle, there are three ways to attack the enemy; use the normal attack(using weapon), use the skill & abilities(requires focus points). On the battle screen, at the top-left, you can see the focus points. These points are required to unleash the skills(Blood Lines) & Abilities(Control, Instinct, Might). The focus points re-generate after a turn. Dodging and Critical Hit – These two behaviors or actions of the character in the battle depends on the equipped gears or luck. If you are lucky, you can win the match even you have low HP. In fact, these two actions can change the result. But strategically playing the turns, spending focus points also matters. You can add “block” too if the character is equipped with a shield as a secondary weapon. You get the skill points, ability points upon leveling up. Make sure to spend these points on leveling up the best skills, abilities. Read the cheats, tips, and strategy guide part below for more info. To use these abilities, you need focus points. In the blood lines section -> vitality -> after upgrading the lesser health, you will unlock three more routes. If you want to improve focus points related performance, then focus on the third lane(improved focus, improved focus regen., focused mind). So this the Vampire’s Fall: Origins guide for the beginners. Now, let’s take a look at our top Vampire’s Fall: Origins cheats, tips & strategies. Weapons or other items play an important role in Vampire’s Fall: Origins game. And you need gold to buy the weapons. We would recommend you to save gold as much as you can(earn gold by defeating the enemies; rats, farmers, completing the quest, hunting the treasure chests) and spend on top-quality gears. Read the buying & selling guide above if you don’t know how to purchase gears in Vampire’s Fall: Origins game. Before you buy the weapons from the merchant, make sure to compare it with the old gear. Tap the item -> on the right side of the screen, you will get the details; rare or common, weight and more. Just below the details, tap the compare button to compare it with the equipped weapon. And also pay attention to the gear’s bonus effect; dodge chances, block chances, critical hit, gold drop, XP, and more. In the early game, the two abilities section are; Control and Instinct. We would recommend you to invest in the Bite ability (INSTINCT) as it can restore the health of the character in the battle. And in the skills menu, we have three sections; Anger, Vitality, Deceit. Anger; To increase the damage power, critical hit chances. Vitality – To increase the HP of the character, focus points attribute. Deceit; To increase the dodge chances, block chances. Simply tap the skill to get info. It’s up to you! Make sure to explore each area in the game and when interacting with the people, read every line. To get more battles, explore in the forests. Explore as much as you can, interact with every character on the screen(you may end up with a great dealer, healer, new quests). Or when exploring, look for the chests. You can obtain gold from these chests. Your health remains the same until you restore it by interacting with a healer or drinking the potion. On the main screen, at the top-right corner, tap the (i) button -> tap the empty slot -> brew the potion. Once done, you can either drink it or store it. Head to the inventory by tapping the Vampire button -> there you can find stored potions. A few days ago, Vampire’s Fall: Origins game updated with a new UI and one new mode named daily brutal. In this mode, you fight against enemies and earn gold. Winning in these battles also grants XP boost to the player(helps you in leveling up fast). Win multiple battles for more rewards. You will be able to participate in this mode once you reach level 26. On the game screen, at the top-left corner, tap the trophy icon -> head to the daily brutal tab to access this new feature. As you know, In Vampire’s Fall: Origins, when you get defeated in the battle, the game sends you on a specific checkpoint. Additionally, it also deducts a small amount of gold from your treasure. 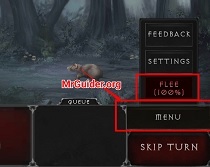 In order to get rid of this problem, make sure to use the flee feature. When in the battle, if you see the enemy is dominating the arena and you are low on health, tap the menu button -> choose to flee(Escape). Prior to it, check the %(if it’s high, then choose. If not, then continue the fight). However, not all the time you get this option. In the center of Avan, there is a character named Farseer Hans-EER. Interact with him and choose the first option: Yes(Watch advertisement). By watching a short video ad, you can get gold, items, boosters or buffs. 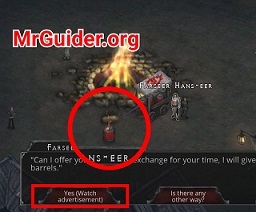 After watching, go close to the red barrel -> interact and claim the reward. The Vampire’s Fall: Origins map is full of treasure. There are many chests on the map. From these chests, you could get the gold. Spend the gold in buying high-quality gears. If you are running out of quests, then explore. Interact with the characters on the map and you will surely get new quests. You can obtain inventory slots by supporting the developers. On the main screen, at the top-left corner, tap the gear icon -> support VF.